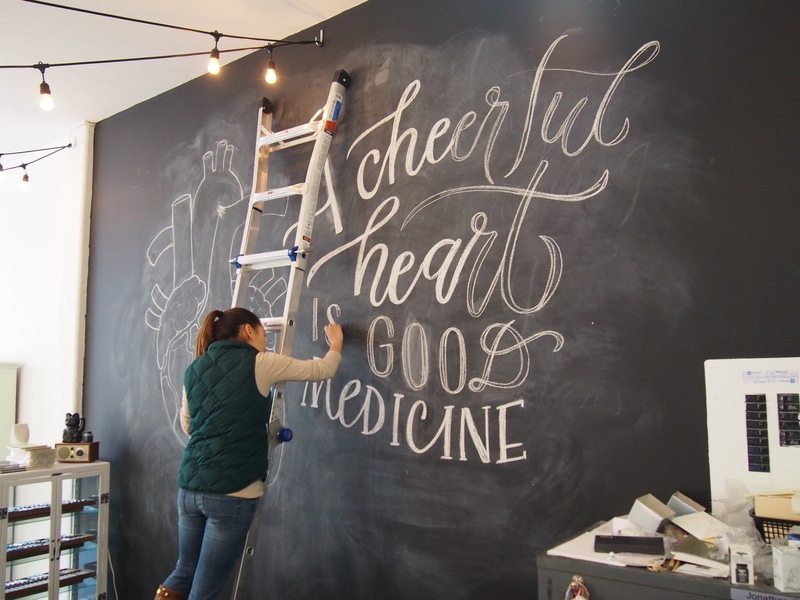 A few months ago, we put out a call for any calligraphers, artists, letterers or graphic designers, aspiring or professional, to come and do up something on our chalkboard wall. When we first moved in, between me and Jon, it was up to me to get something up on the wall, but we know that there are so many talented and amazing artists out there in our community and in Toronto. We certainly believe in paying artists for their work and creativity, but not exactly being a Forbes 500 company, we could only offer the chalk + board, $100, plus some free promotion on our blog and social media. I was beyond thrilled, then, to get an e-mail from someone like Sarah Kim! 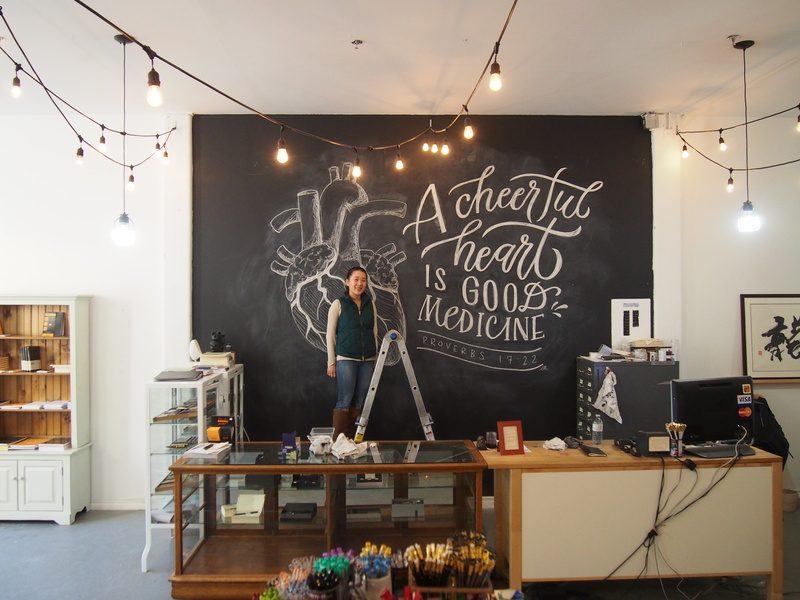 She trained and now works as a biomedical illustrator, but also has a growing personal business doing custom lettering and calligraphy work, which she shares about on her amazing Instagram account. 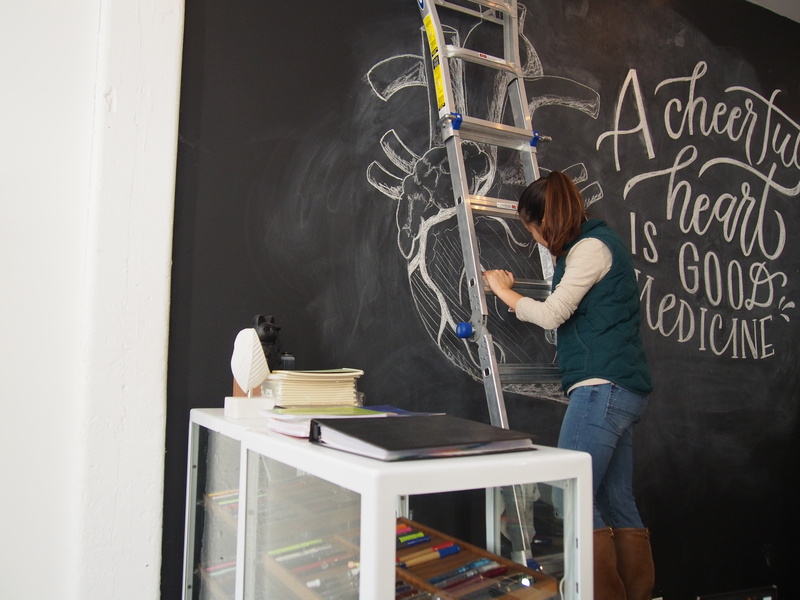 Sarah came in this past Monday to climb up our ladder and leave her mark on our wall. Being a medical illustrator, and with Valentine’s Day coming up, an anatomical drawing of a heart and a Proverb for cupid’s day that reminds everyone what really matters in the heart, whether or not you’re in that perfect relationship, seemed just right. We couldn’t be more thrilled! And not only because Sarah herself is a delight, and friendly, and super easy-going – a complete pleasure to have in our shop, if only for a few hours. 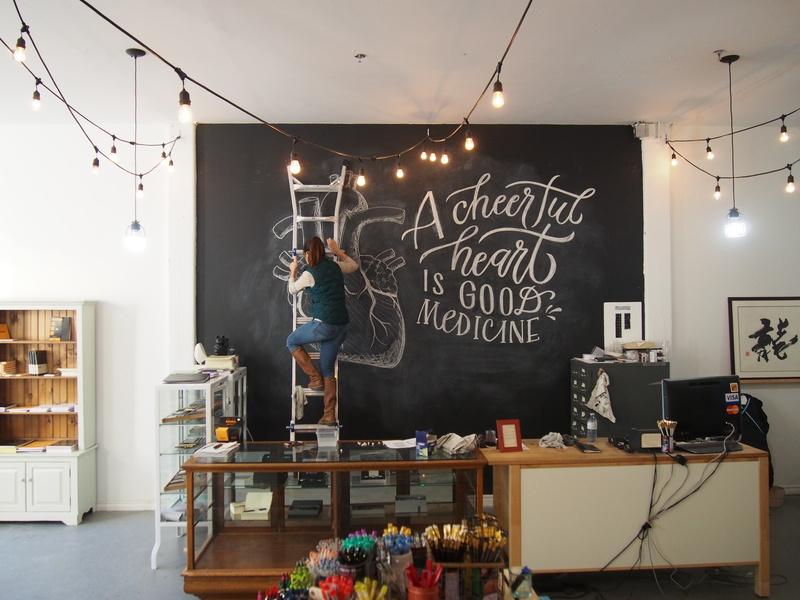 The chalkboard itself is gorgeous. If you haven’t stopped by the shop this week already, you need to come by sometime in the next month or so to check this out in person! A cheerful heart is truly good medicine. Sarah was kind enough to allow me to tape her putting it all together, and trust me to put some music to it. Even though Sarah came by to do her work on Monday, and it’s now Thursday, this has not been without some pain. This video has been a piece of my soul. I used to have a 6-year-old Macbook that I used to complain about all the time because it was six years old and very slow. Upon the advice of my favourite customer Claudia, who I’ll forgive because you know, she’s still kind of awesome, I got a refurbished Mac, and despite every single Apple technical support guy telling me it has nothing to do with the fact that it’s furbished, this Mac has eaten up more hours of my life in hard re-starts and forced quits and dropped internet connections and frozen applications. To finally get my iMovie working to put this video together, I have spent literally hours – literally – on the phone with Apple support, and let me tell you – they may be smarter than me, but they are no geniuses. I had to listen to some Apple tech give me a play-by-play along the lines of “just have something in my eye here, oh I think it’s a hair, hmm, man, this thing is really stuck, oh, almost there, I’m getting it, oh, man, is it in here good, just a little more, it is a hair!” and another inform me that its maybe my trash can being full that’s causing me entire computer to freeze and crash, and hear “hmm…strange…” more times than I can count. So I’m telling you the truth when I say that I put together this video out of both deep and abiding love for you all, and also tenacity that you will never see the likes of again. If you watch carefully at the beginning of the video when Jon is cleaning off the board, you can see a little monster toddling around back and forth across the shop. And at the very end, you can also see that same baby ogre doing his thing (i.e. getting in the way.). As a bum note on the side, I’m sorry to say we’re going to have to be raising some prices. The Canadian dollar, the Canadian dollar. We’ve been sitting around the dinner table bemoaning it, but unfortunately, we can’t stay alive with prices as they are. And additionally, some of our prices are below what our manufacturers require them to be, which isn’t fair to anyone – our manufacturers or other retailers in particular. We’re going to be seeing some big increases on Edison, which is something we should’ve done a while ago. Edison pens are going up from $175 to $210 taking place tomorrow (hustle, friends!). TWSBI, Platinum, Lamy, Sailor are going to see some small prices increases, all taking place February 5th. There may also be some small price increases on individual products on other brands, but these are the big ones. We’ve grouped these price increases together to announce all at once, even though we’ve been eating the difference for a while: some of them are price increases from our distributors, and some are discrepancies in the exchange rate. We’re sorry. You know that we love to give to you the best and fairest prices we can, and while I know the price isn’t the only important part of a purchasing decision, it is important for all of us. Know that we will continue to try our best to offer you the very best that we can. Sarah is terrific and so is the video! I’m feeling smug that I gave into temptation and bought my Edison Collier earlier this month. I figured the exchange rate had to impact the price sooner or later, and was happily surprised that the price was still the same as last summer when I first looked at the pen. I love the pen, too! Sarah was amazing! It’s incredible how easily these beautiful letters came out from her fingers. Dearest Liz, Just to let you know as I was looking at the pictures of Sarah creating, my eye was caught by your stock in the foreground, so much so that I went back to examine it. Oh a blog is mighty marketing! As something of a n00b when it comes to the vast world of pens and stationary I quickly found myself having some minor heart issues when I saw the prices of some of the more esoteric things available. Every Site I stopped at was filled with beautiful reviews, essays, articles and such but along with the beauty was the Foreign Pricing and *shudder* Shipping/Handling. So when I fearfully typed in “Canadian Fountain Pen Supplier” I was overjoyed to see Wonder Pens pop up on Google. A Domestic source with comparable prices! And not to have to sever an appendage to pay for Shipping! I don’t even get that excited at Christmas I promise you that. Not to ramble even more.. Your prices are exceptionally fair, please do not agonize over the increases. Every Canadian is well aware that our Dollar is hurting rift now and should be completely understanding of the need to bump things up in the face of this economy. I’m so glad you found us!! And thank you also for your very kind words of support. Sometimes it feels like as a Canadian site we just keep increasing and increasing, and it’s always a terrible feeling to announce another price increase.